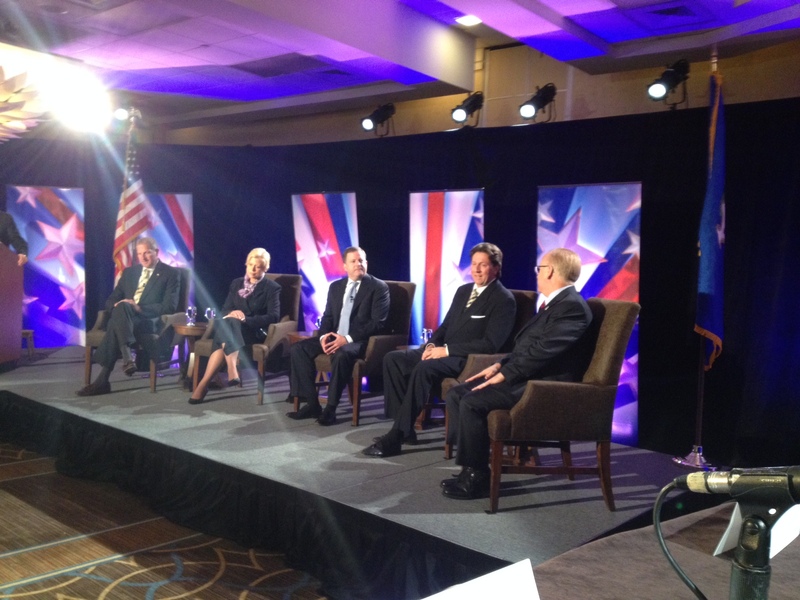 GOP candidates for governor debated in Stamford. From left, Mark Lauretti, Martha Dean, John McKinney, Joe Visconti and Mark Boughton. Stamford — Four of Connecticut’s Republican gubernatorial contenders indicated Wednesday that they would ask unionized state employees to grant concessions in 2015 – for the third time in seven years – to help balance the budget. Answering questions at a debate in Stamford, state Senate Minority Leader John McKinney of Fairfield, Danbury Mayor Mark Boughton, Avon attorney Martha Dean and Shelton Mayor Mark Lauretti all said the state’s worsening budget deficit requires more worker sacrifices. And the fifth Republican at Wednesday’s debate at the Stamford Sheraton Hotel, West Hartford businessman Joe Visconti, didn’t say he would seek concessions. But he did say workers need to give back, and he predicted they would support concessions to stabilize the long-term future of their salaries and benefits. Greenwich businessman Tom Foley, the GOP’s 2010 gubernatorial nominee and a candidate again in 2014, did not attend Wednesday’s debate, which was sponsored by the Business Council of Fairfield County, Cable News 12 and the Hearst Newspapers. “At the end of the day, we need fiscal sanity,” McKinney said, adding that reforms are particularly needed to prevent abuses involving pensions and other retirement benefits. Dean agreed that rank-and-file state workers aren’t responsible for the state’s fiscal woes. The blame rests, she said, on “this unholy alliance between the union bosses and the politicians.” She added that she thinks public-sector collective bargaining rights should be repealed. But one of the largest unions representing state employees, Council 4 of the American Federation of State, County and Municipal Employees, said vilifying public-sector workers won’t solve the state’s fiscal challenges. “State employees have stepped up to the plate time and again, providing billions in savings to taxpayers while protecting vital services in these tough economic times,” said Council 4 spokesman Larry Dorman in a telephone interview after the debate. “It’s too bad the Republican candidates don’t recognize the sacrifices our members have made. Sadder, still, is their belief that laying off middle-class workers and slashing their health care and retirement security, will boost Connecticut’s economy. Connecticut needs more middle-class, family-supporting jobs – period. “What Connecticut does not need is more pandering to big corporations and the super-rich, who are doing just fine,” Dorman said. Most unions agreed in 2009 to a one-year wage freeze. That deal also required workers with five years of experience or less to contribute 3 percent of their pay to help fund their retirement health care benefit. A larger concessions package ratified in 2011 included a two-year wage freeze, a requirement that all workers contribute toward retirement health care, and new limits on pensions and health coverage. The legislature’s nonpartisan Office of Fiscal Analysis has been tracking a $1 billion deficit in state finances in the first new budget after the November elections. And, based upon a new revenue forecast released Wednesday afternoon, the potential shortfall in the 2015-16 fiscal year approaches $1.4 billion, or more than 7 percent of annual operating costs. Boughton said he already has a track record of cooperating with unions in Danbury’s municipal government to negotiate and achieve concessions savings. “I’ll take the same approach at the state level,” said Boughton, who also charged that political alliances between unions and Democratic politicians has led to excessive worker perks and benefits.